Our range of products include online flying laser marking machine, online pipe laser marking machine and irrigation pipe laser marking machine. We are offering Online Flying Laser Marking Machine to our clients. 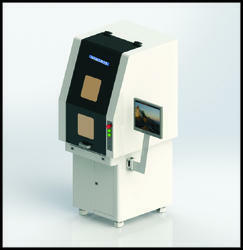 Online Flying Laser Marking Machine renders consistent performance at operation. Online Flying Laser Marking Machine offers the best marking visibility. Online Flying Laser Marking Machine prints/marks on and Pipes. marking can be done on Drip Pipes with the help of synchronization with the line speed of with the motors. The marking does not penetrate the actual pipe wall, thus no wall thickness reduction. Laser marking on plastics tube, pipe, irrigation pipe with moving on line. Laser marking on HDPE, PPR, UPVC, PVC and Pipes. We are offering Online Pipe Laser Marking Machines to our clients. "Mark on-the-Fly" stands for the marking of moving workpieces. For continuous production lines, marking 'on the fly' offers great solution flexibility by enabling marking of the product while it is moving. Online Pipe Laser Marking Machine was developed through which high speed permanent and abrasion free printing is achieved. There are no on-costs for additional maintenance or necessity for supplementary consumable items. The printing and marking is done without problem on all current products and at production speeds up to 200 m/min. Online Pipe Laser Marking Machine requires a specific software that takes the speed of the pipe into account in order to ensure distortion-free marking.On The Fly laser marking machine can be directly deployed with customer assembly line and if necessary, assembly line and worktable can also be customized. Online Pipe Laser Marking Machine renders consistent performance at high speed operation. Online Pipe Laser Marking Machine offers the best marking visibility. Online Pipe Laser Marking Machine prints/marks on HDPE, PPR, UPVC, PVC and LLDPE Pipes. Laser marking on plastics tube,pipe,irrigation pipe with continually moving on production line. "Irrigation Pipe Laser Marking Machine" stands for the marking of moving workpieces. For continuous production lines, marking 'on the fly' offers great solution flexibility by enabling marking of the product while it is moving. Marking on-the-fly places the highest demands on precision and speed of the marking laser.Irrigation Pipe Laser Marking Machine requires a specific software that takes the speed of the workpieces into account in order to ensure distortion-free marking.Irrigation Pipe Laser Marking Machine can be directly deployed with customer assembly line and if necessary, assembly line and worktable can also be customized. Irrigation Pipe Laser Marking Machine renders consistent performance at high speed operation. Irrigation Pipe Laser Marking Machine offers the best marking visibility. The machine is designed for achieving precise positioning even on components moving at high speed. Irrigation Pipe Laser Marking Machine on plastics tube, pipe, irrigation pipe with continually moving on production line. Irrigation Pipe Laser Marking Machine marks on Electrical wires and Industrial cables. Irrigation Pipe Laser Marking Machine use in Food packaging industry. Irrigation Pipe Laser Marking Machine use in Medicine packaging and Soft drink packaging industry. Among its many features are ease-of-use, high performance, flexibility, and low cost that give you the best laser marking software on the market today. LIPI software is developed by our highly skilled professionals developers.